Some of the world’s largest reserves of crude oil are held in the oil sands in Alberta, Canada, and production has been ongoing. A new study shows that contaminants from the development of the sands are stacking up in the environment. The scientists published their findings in the journal Proceedings of the National Academy of Sciences¹. The researchers studied five lakes near mining and upgrading operations around Fort McMurray, Alberta, and another lake 90 kilometers northwest. They found that the levels of polycyclic aromatic hydrocarbons (PAHs), which are carbon-based compounds, some of which can be toxic or carcinogenic, in lake sediments have been on the rise since the 1960s. By 2011, PAH levels in these lakes ranged from 2.5 to 33 times higher than before 1960. The scientists checked the PAHs found in the lakes against those associated with bitumen from the nearby Athabasca oil sands in order to examine the likelihood that the chemicals were coming from natural sources, like forest fires. They found that levels of industry-related chemicals in the lake sediments rose sharply from 1990 onwards. 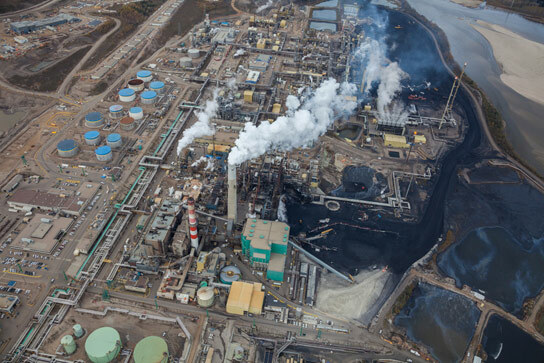 “The signature of the PAHs and the timing strongly suggest that development and the refining of the oil sands plays a role in PAHs increasing in these lakes,” says Joshua Kurek, an environmental scientist at Queen’s University in Kingston, Canada, and lead author of the study. These results build on two studies published in 2009 and 2010, which found elevated levels of PAH and heavy metals in river water and snow downstream from mining operations² ³. “Lake sediments accumulate 24 hours a day and 365 days a year. They are slowly and indirectly monitoring the environment around us, collecting contaminants,” says John Smol, a limnologist at Queen’s University and a co-author of the study. The rise of contaminants didn’t negatively affect algae and microscopic invertebrates. They actually thrived because microorganism populations are boosted in warmer temperatures; the average temperature in Fort McMurray has increased by 1.65 °C since 1960. Crude-oil production is expected to double between 2011 and 2020 in Alberta and the province’s government announced that it would create an independent agency to monitor pollutants. Kurek, J. et al. Proc. Natl Acad. Sci. USA doi: 10.1073/pnas.1217675110 (2013). Kelly, E. N. et al. Proc. Natl Acad. Sci. USA 107, 16178–16183 (2010). Be the first to comment on "Pollutants in Lakes Linked to Oil Sands"